When it comes to career aspirations, Shauney Moen is a woman with many interests, but only one true love. It was always going to be physical therapy. "I was always into sports — I played volleyball, softball and did weight lifting in high school," Moen said. "My junior year of high school I tore the labrum cartilage in my shoulder and did a ton of physical therapy. So when I took a good look at what I wanted to do, physical therapy really jumped out at me." But Moen didn't go in a direction you'd expect. Not right away, at least. Coming into St. Scholastica, Moen was all over campus — softball, science, psychology and more — pursuing each passion with equal measure. "Since I was biology/pre-med my first year, I missed out on the chance to take a lot of the courses I would need for exercise physiology. I would have had to play major catch-up, so I landed on psychology," Moen said. "I figured if I was going to be working with people all of the time, it'd be good to get to know how they tick." Then, after finishing her undergraduate degree, Moen applied to a number of PT schools, only to find herself stuck in wait-list "limbo." So she adapted, finding work at the Marty Mann House (alcohol and drug treatment) while she completed the accelerated 1-year Masters in Exercise Physiology program at St. Scholastica. "I looked for opportunities that would beef up my résumé and put me in the best position to be prepared for PT school," Moen said. "I worked with people who were in vulnerable positions, and even though it wasn't exercise-related, I was still building patient-provider relationships." With new experiences and expertise in tow, Moen was accepted into the Doctor of Physical Therapy program (DPT) at St. Scholastica during the summer of 2015. "We really hit the ground running, with foundational classes like anatomy and biomechanics," Moen said. "That's the idea of the program: that each class builds on the previous one. The professors do an excellent job of helping us think past the basics to truly understand the material." 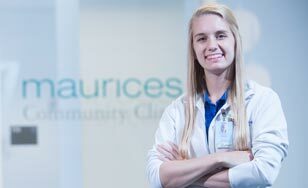 Moen expressed excitement over the opportunity to study and practice in the brand-new maurices Community Clinic located in the Health Science Center at BlueStone, which opened in fall 2016. Under the supervision of program faculty, the Clinic provides free care to uninsured or underinsured community members. Plus, students are offered the unique opportunity to establish patient-doctor relationships, experience interprofessional dynamics, and provide excellent care in a state-of-the-art facility. And now, in her second year in the program and with an internship at Mayo Clinic on the horizon, Moen is excited for what the future holds. "I'm looking forward to connecting with patients on a personal and professional level to get them the care they need," Moen said. "One of the biggest things for me is seeing them [patients] grow and get stronger through good days and bad days until they get back to what they love doing."